April 3, 2009 | Once a year, college kids everywhere leave their books and studies and merge on beaches around the country. Spring break has become that long awaited, highly anticipated event where many travel great distances for sun and fun. I've done the whole leave Logan and visit warm sunny beaches thing, but this year, I went to a different beach, one complete with gloves, goggles and snow. And boy was there a lot of snow! I spent Friday the 13th up at Beaver Mountain with several friends. For me, it was my first time up this year and the snow was glorious! Lucky for us, it had dumped several feet earlier in the week, leaving us a great powder base. That day was one of the warmest days I've ever skied. By the end of the day, I had already shed several layers of sweatshirts and extra shirts. The sky was a fantastic blue, with large billowing clouds. Being a Friday, the slopes were relatively empty. Short lines and empty slopes made for quick, fun runs. It was almost like being the only ones on the mountain. Having grown up in Logan, Beaver Mountain has been a tradition in my family. Every winter, we go up at least a few times. It was on Little Beaver that I first learned how to ski. A few years ago, I had a season pass. I spent every Friday skiing and went at least once or twice a week. Although Beaver isn’t as big as some of the resorts in Salt Lake, it still has great snow and with the addition of Marge's Triple (a whole new side of the mountain) there are tons of great runs to try. Over the years, Beaver Mountain has put in a triple lift and expanded their lodge. For someone who's skiing Beaver for the first time, these might not be huge, but for a local, you notice and change! After each snowstorm, the runs change, leaving you with a whole new playground. We took runs all over the mountain. Some we meandered down, taking our time and enjoying the crisp, cold air, chatting as we went. Other runs we went full out, racing to the end. The day unfortunately ended with a trip to the emergency room. One of our friends hit a jump and it was all down hill from there. 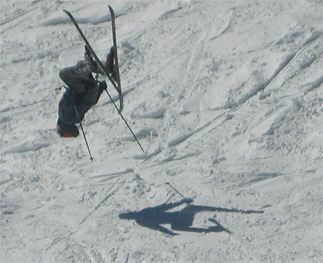 He crashed so hard that he snapped his ski in half. After three hours at the emergency room, we discovered he had broken his leg, ruptured his spleen and cracked his back in three places. Good news is, hes fine and ready to hit the slopes again. It just won’t be until next year.